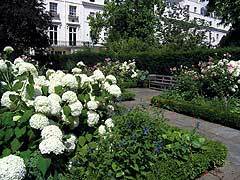 Chester Square is one of my favorite spots in Belgravia. Free from a large degree from traffic, focused at the south end on St. Michael’s church designed by Thomas Cundy I, “2nd Rate houses” of relatively modest proportions and a narrow square width that works – there is a lot to like. difficult to observe. Additionally, the bisection of Eggleston Street creates a degree of permeability. The original layout shown in the Greenwood map of 1830 suggested another break in the southern park which would have further increased the ability to easily pass from one side to another. 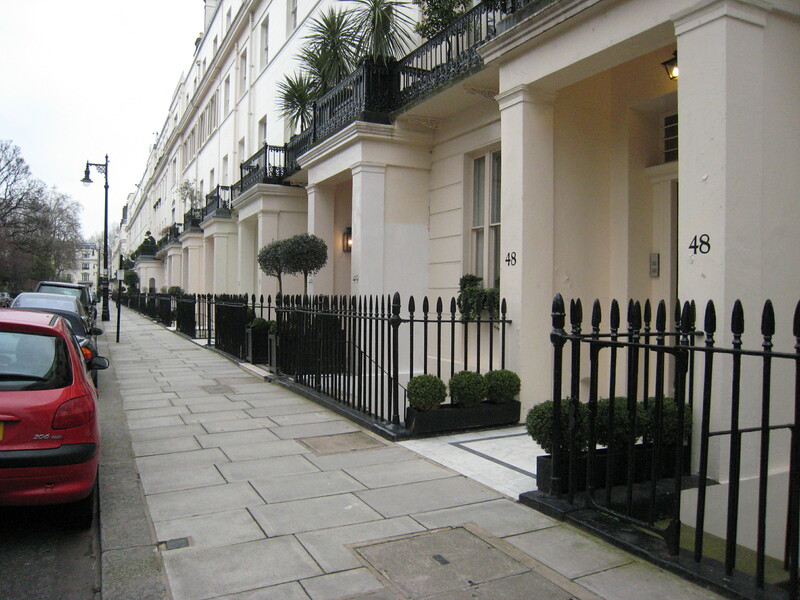 Chester Square was an afterthought to the original Belgravia plan. A man named Watkins petitioned the Grosvenors in 1828 to combine with his holdings on Ebury Street immediately south in order to introduce a narrow and elongated Chester Square. Supported by Cundy, the plan was effected, and construction began around 1832. The cross dimensions are worth looking at in detail, as they are about as thin as would be desirable. The green itself is 66 feet to the railings, and then 2 feet to the face of curb. The street is 29 feet wide with on street parking. The dimension from face of dwelling to curb is only 15 feet, including a 8.5 foot sidewalk. 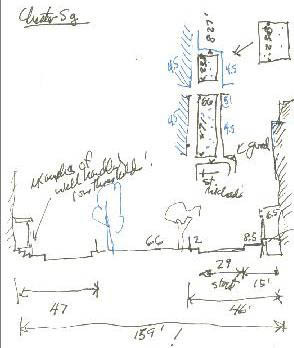 The overall resulting dimension of 159 feet makes for about as narrow an assemblage as possible – given the adequacy of the park, which is substantial. When we look at what works here and doesn’t in the Cadogan assemblage along Sloane Street, we find the true key in the narrow width. Here in Chester Square, there is a great sense of community and being tied with those across the park. People are readily recognizable from sidewalk to sidewalk. At Cadogan, it is a matter of estrangement. Great attention was given to the design of the balcony railings above the Doric porticos. The SE and Ne terraces were built by Joseph Cundy, brother to Thomas Cundy II who about this time took over the architectural approval work for the Grosvenor Esate from his father. The northwest side was built by Seth Smith over a period from around 1832 to 1845 – the last houses of the range reflecting Italianate. The fine gothic church at the southern terminus of the square was built in 1844. Lord Grosvenor donated 5,000 pounds to the effort.